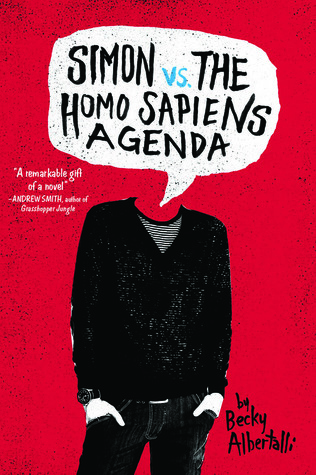 Simon vs. the Homo Sapiens Agenda is by Becky Albertalli. 1. I will admit that I read Albertalli's second book, The Upside of Unrequited, before this book and the books have a loose connection. I enjoyed this book, but not as much as the The Upside of Unreqiuted. Her characters are quirky and realistic. I feel like their problems are problems that real people have. 2. Simon is pretty adorable. I would definitely want him as a friend. His love of Harry Potter and Oreos totally won my heart. His struggle with his crush on Blue, and wanting to meet him, and worried how he will react is a problem anyone can relate to whether gay or straight. I can definitely relate to how his parents makes a big deal out every mile stone in their children's lives. It both sweet and horrifyingly embarrassing. 3. I admittedly vacillate between hating Martin, the guy blackmailing him, and feeling sorry for him. He is obviously awkward and wants to figure out how to approach his crush, but he goes about it all wrong. 4. I do not know if this is what Albertalli intended but I figured out fairly early Blue's identity based on something that happened in Simon's English class. Also for me, I thought it was weird that everyone's older sibling seemed to be going to college out of state. Okay, Abby's brother made sense because she moved from D.C. But the others did not, being from Georgia myself, most people stay in state due tuition and Hope scholarships.